One year ago, on 27 March 2017, Labour said it would hold the Tories to their pledge to keep the exact same benefits of the EU Single Market after Brexit. Of course, that can’t happen unless the UK is in the Single Market, accepting its rules including Free Movement of People. 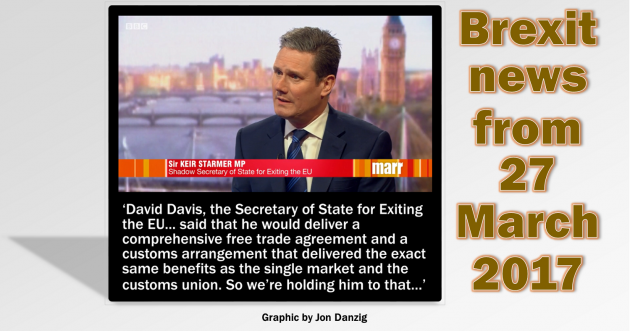 In a significant shift in Labour’s position, Shadow Brexit Secretary Sir Keir Starmer has said that Labour will oppose any Brexit deal that doesn’t offer Britain the exact same benefits as being in the EU Single Market and customs union. It’s a welcome new stance by Labour, and although a little late (where was Labour’s strong stance in the Brexit Bill debate?) it’s hopefully not too late. But in the same breath, Sir Keir has said that Free Movement of People “has to go when we exit the EU..” Doesn’t he realise that Free Movement of People is a key benefit of the Single Market and an essential requirement to be in the Single Market? Labour still seems confused about the EU. By now, Sir Keir should realise that it’s impossible for Britain to enjoy the ‘exact same benefits’ of the EU without being in the EU. 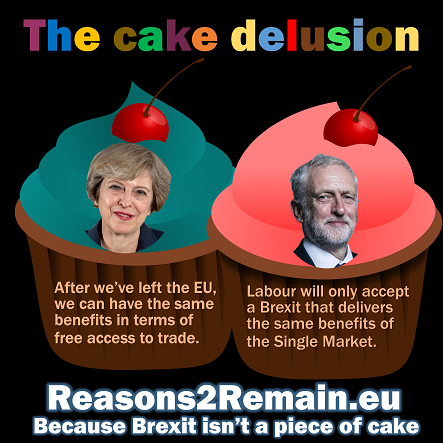 So instead of fudging Brexit, Labour should come clean and say it loud and clear: Britain can only enjoy the same benefits it enjoys now by staying in the EU. Labour should be fighting tooth and nail to #StopBrexit. In particular, any Brexit deal must offer the “exact same benefits” the UK currently has from the EU Single Market and customs union. KEIR STARMER: Well, what I’m setting out tomorrow are six tests for the final deal for Brexit. So far all the attention’s been on should the Prime Minister have permission to start negotiations. We’re through that part. Now what comes into focus is what is the right deal, because this is about our future relationship with the EU. So I’m setting out six tests for the government. We then start a two year process, probably more than a two year process and it’s for the government to negotiate and come back with a deal that’s right for our country. ANDREW MARR: And luckily and happily for us both I have your six tests here. I won’t go through all of them. You say you want a strong collaborative future relationship with the EU. I would suggest that everybody wants that. KEIR STARMER: Well you say that but I think some of the pure Brexiteers actually want us to crash out either at the Article 50 stage in two years or before that, so I accept that the majority of people want a collaborative strong relationship but it is important to say that because not everybody’s in that place. ANDREW MARR: You’ll have seen the word of Michel Barnier and others this week about what might happen if we don’t have a deal. In your view how damaging would it be not to have a deal? KEIR STARMER: Oh very damaging. Very damaging economically, that’s what the CBI, what the Mayor of London and many others have said in pure economic terms. But there’s also Britain’s place in Europe and in the world. If we crash out without a deal with no meaningful relationship with our EU partners. Now I accept we won’t be members but we must be partners and this has to be fought for over the next two years. ANDREW MARR: Okay, let’s come onto the second bit which is slightly crunchier. You say we want the exact benefits, your words, from the single market and the customs union. Can I put to you that that is just not going to happen. 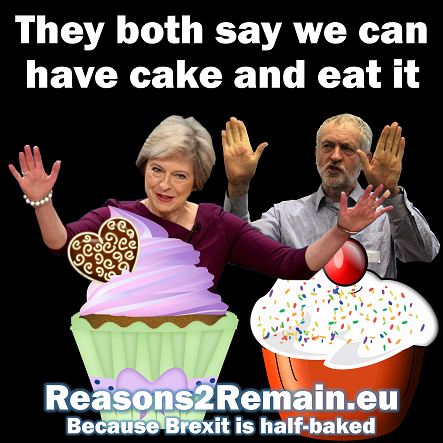 We’re outside both of those things, Michel Barnier and others have made it absolutely plain that we cannot get all the same benefits as if we were inside and therefore that is a hopeless thing to ask for. KEIR STARMER: Well we’re not inside, I accept that. I do not accept that we can’t have the same benefits. ANDREW MARR: The exact same benefits? KEIR STARMER: Now those words, ‘exact same benefits’ are not my words. ANDREW MARR: They’re in your six list. KEIR STARMER: They’re in my test but they’re taken from David Davis, the Secretary of State for Exiting the EU. 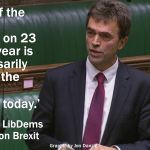 When he was pressed on this in parliament he said that he would deliver a comprehensive free trade agreement and a customs arrangement that delivered the exact same benefits as the single market and the customs union. So we’re holding him to that test. The government can’t turn round now and say this is unachievable because it was David Davis who the Prime Minister has appointed in the role of the exiting the EU who set that as (his achievement). ANDREW MARR: Now we come onto the next very interesting bit which is that Mr Barnier, Mr Juncker this week and many others have said that it may be achievable but there is a real price to pay. It’s about £50 billion. Is that a price worth paying so far as the Labour Party is concerned? KEIR STARMER:Well so far as the money is concerned I wouldn’t get into a debate about the precise figure, but I would say this. I think it’s very important early on that the principles of liability established, what is the money for, what are the principles that are to be applied to it and then I think the Prime Minister should say loud and clear, we are a country that complies with our international obligations and when a figure is arrived at, that is a figure that the UK as an international country would pay. ANDREW MARR: You accept that we would have to pay a fairly hefty bill. Let’s not talk about numbers, but a fairly hefty bill in return for getting free access to the single market? KEIR STARMER: Well as I say there will be principles, there will be a bill and I think we should say loud and clear we’re a country that honours our obligation. Now how much and over what period is to be negotiated. I am very strongly of the view that there ought to be transitional arrangements from March 2019 until we reach and conclude these strong collaborative relationships that we need. So that could be paid over a longer period if we get the right relationship. ANDREW MARR: Now among the others on the list – I won’t go through all the tests but you talk about ‘the fair management of migration in the interests of the economy and communities’ which if I may say so is a fairly bland thing to say. Can I ask you to explain to us in a single sentence what Labour’s immigration policy now is. KEIR STARMER: Well, we are clear that immigration was part of the debate in the referendum and therefore there’s got to be to change to the freedom of movement rules. So that goes. ANDREW MARR: So freedom of movement goes? KEIR STARMER: That has to go and when we exit the EU therefore there won’t be that rule. ANDREW MARR: Your Leader suggests that might not be the case. It might go or it might not, he said. ANDREW MARR: So he was wrong about that. KEIR STARMER:- is that we must have managed migration. I think the two most important things are firstly what’s going to work for the economy and then secondly what’s right for our communities. ANDREW MARR: And do you see EU migration falling dramatically or substantially as a result of us leaving the EU? KEIR STARMER: I think it might fall but I’ve talked to hundreds of businesses across the UK in the last three or four months. Literally hundreds of businesses. They’re very anxious and very concerned that there should be the right rules in place to enable them to continue with their businesses and I think everybody is in that place. ANDREW MARR: You rule out freedom of movement staying? KEIR STARMER: Well freedom of movement is an EU rule and therefore that will go. There will be a blank piece of paper and we then start with the principles that we need to apply to a future looking immigration policy. ANDREW MARR: A slightly confusing sentence. 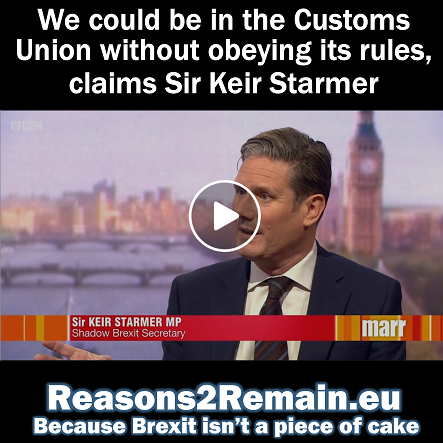 KEIR STARMER:- this is an EU rule and it will go once we depart. And that actually gives an opportunity in the Labour Party and elsewhere to say what does a principle based immigration policy look like that works for our communities and works for businesses. ANDREW MARR: Let’s come to the really crunch questions. There are your principles. If you don’t get them what do you do? KEIR STARMER: Well, I’ll say this first. I hope that the Prime Minister gets the right deal for our country because this is not about party politics, but about the future of our country. 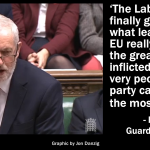 This entry was posted in Current Affairs, Politics & Public Policy, The EU and tagged brexit, David Davis, European Union, Keir Starmer, Labour, Single Market. Bookmark the permalink.